^ a b c d e "RMB increases its influence in neighbouring areas". People's Daily. 17 February 2004. Retrieved 13 January 2007. ^ Hungwe, Brian. "Zimbabwe's multi-currency confusion". BBC. Retrieved 22 July 2014. ^ "Zimbabwe to make Chinese yuan legal currency after Beijing cancels debts". The Guardian. 21 December 2015. Retrieved 26 December 2015. ^ Mulvey, Stephen (26 June 2010). "Why China's currency has two names". BBC News. ^ a b Lipman, Joshua Klein (April 2011). "Law of Yuan Price: Estimating Equilibrium of the Renminbi" (PDF). Michigan Journal of Business. 4 (2). Retrieved 23 May 2011. ^ Schneider, Howard (29 September 2012). "Some experts say China's currency policy is not a danger to the U.S. economy". The Washington Post. ^ a b "RMB now 8th most traded currency in the world". Society for Worldwide Interbank Financial Telecommunication. 8 October 2013. 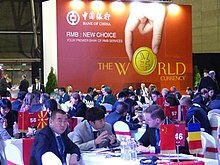 ^ a b "RMB breaks into the top five as a world payments currency". Society for Worldwide Interbank Financial Telecommunication. 28 January 2015. ^ a b Solomon Teague (6 October 2016). "FX: RMB joins the SDR basket". Euromoney. ^ Badkar, Mamta (27 February 2014). "Chinese yuan's drop is largest since its 2005 currency revaluation". Business Insider. Retrieved 3 March 2014. ^ a b "中华人民共和国第一套人民币概述" [People's Republic of China first RMB Overview]. China: Sina. Retrieved 6 April 2012. ^ Bradsher, Keith (30 November 2015). "China's Renminbi Is Approved by I.M.F. as a Main World Currency". NY Times. Retrieved 30 November 2015. ^ Coldness Kwan (6 March 2007). "Do you get one fen change at Origus?". China Daily. Retrieved 26 March 2007. ^ "中国最早的一张人民币". Cjiyou.net. 22 October 2007. Retrieved 6 April 2012. ^ Quentin Sommerville (13 March 2006). "China mulls Mao banknote change". BBC News, Shanghai. Retrieved 18 March 2007. ^ "'Critically important' that China move on currency: Geithner. Treasury chief says he shares Congress' ire over dollar peg". 10 June 2010. ^ Phillips, Michael M.; Talley, Ian (21 June 2010). "Global Leaders Welcome China's Yuan Plan". Wall Street Journal. ^ Adinolfi, Joseph (10 August 2015). "China has effectively re-pegged the yuan". Market Watch. Retrieved 28 November 2015. ^ "央行行长周小川在央行上海总部揭牌仪式上的讲话". 10 August 2005. ^ David Barboza (10 April 2008). "Yuan Hits Milestone Against Dollar". New York Times. Retrieved 11 April 2008. ^ Frangos, Alex (16 September 2010). "Don't Worry About China, Japan Will Finance U.S. Debt". The Wall Street Journal. ^ "Chinese Renminbi Futures" (PDF). CME Group. Retrieved 19 February 2010. ^ "World Economic Outlook Database, April 2009". IMF. Retrieved 6 January 2015. ^ "QFII". Financial Times. Retrieved 16 October 2013. The qualified foreign institutional investor (QFII) programme started in 2002 and allowed licensed foreign institutional investors a quota to buy Chinese-listed A-shares (previously only available to domestic investors). ^ Chris Wright. "ICBC bond: latest step on London's road to RMB dominance". Financial Times. Retrieved 16 October 2013. ^ Joachim Nagel. "The Internationalisation of the Renminbi". Deutsche Bundesbank. Retrieved 13 October 2013. ^ "Quotes of the Day". Time (magazine). 24 November 2010. Retrieved 13 October 2013. ^ Emma O’Brien & Artyom Danielyan. "Yuan-Ruble Trading Starts on Moscow's Micex as Russia, China Shun Dollar". Bloomberg News. Retrieved 13 October 2013. ^ "China and Japan plan direct currency exchange agreement". BBC. 26 December 2011. Retrieved 13 October 2013. ^ Kosuke Takahashi. "Japan, China bypass US in currency trade". Asia Times Online. Retrieved 16 October 2013. ^ "China and Australia Announce Direct Currency Trading". National Library of Australia. Archived from the original on 21 June 2013. Retrieved 16 October 2013. ^ "UK and China in £21bn currency swap deal". BBC. 23 June 2013. Retrieved 13 October 2013. ^ "ECB and the People's Bank of China establish a bilateral currency swap agreement". European Central Bank. Retrieved 13 October 2013. ^ Gabriel Wildau (8 October 2015). "China launch of renminbi payments system reflects Swift spying concerns". Financial Times. ^ "The Use of RMB in International Transactions" (PDF). Retrieved 2 July 2016. ^ Barboza, David (11 February 2011). "In China, Tentative Steps Toward a Global Currency". The New York Times. ^ "ANZ, Westpac to lead Chinese currency conversion". Australian Broadcasting Corporation. 8 April 2013. Retrieved 8 April 2013. ^ "Bank of China to serve as yuan clearing bank in S. Africa". Xinhua. 8 July 2015. Retrieved 22 July 2015. ^ Cookson, Robert (28 July 2010). "China revs up renminbi expansion". The Financial Times. ^ Brown, Kevin; Cookson, Robert; Dyer, Geoff (19 September 2010). "Malaysian bond boost for renminbi". The Financial Times. Asia-Pacific. Retrieved 7 October 2013. ^ Bradsher, Keith (30 November 2015). "China's Renminbi Is Approved by I.M.F. as a Main World Currency". New York Times. Retrieved 22 August 2018. ^ "The Basic Law of the Hong Kong Special Administrative Region of the People's Republic of China". 4 April 1990. Retrieved 23 March 2007. Article 18: National laws shall not be applied in the Hong Kong Special Administrative Region except for those listed in Annex III to this Law. ^ "The Basic Law of the Macao Special Administrative Region of the People's Republic of China". 31 March 1993. Retrieved 23 March 2007. Article 18: National laws shall not be applied in the Macao Special Administrative Region except for those listed in Annex m to this Law. ^ "Hong Kong banks to conduct personal renminbi business on trial basis". Hong Kong Monetary Authority. 18 November 2003. Retrieved 22 March 2007. ^ "Bank of China New York Offers Renminbi Deposits". Retrieved 15 February 2011. ^ "Macao gets green light for RMB services". China Daily. 5 August 2004. Retrieved 22 March 2007. ^ "Regular Press Briefing of the Mainland Affairs Council". Mainland Affairs Council. 5 January 2007. Archived from the original on 27 September 2007. Retrieved 21 March 2007. ^ "Taiwan prepares to allow renminbi exchange". Financial Times. 3 January 2007. Retrieved 13 March 2007. ^ "Widely used in Mongolia". chinanewswrap.com. 7 May 2009. Archived from the original on 25 February 2012.